The Huronia Stallions Varsity team improved to 4-2 on the season with a convincing 20-0 victory over the Cornwall Wildcats. The Stallions offence generated two scores on Justin Janicki and Michael Cassano touchdown runs. Will McCulloch chipped in a field goal to round out the scoring. Right Guard Chris Costigan had a spirited game with several devasting blocks mixed with two over aggressive penalties. Costigan played on the edge but was able to set the tone and helped ensure the Stallions dominated the line of scrimmage. Quarterback Justin Winn provided a key second half spark coming off the bench to not only play well but drive the offence down the field running a no-huddle package. 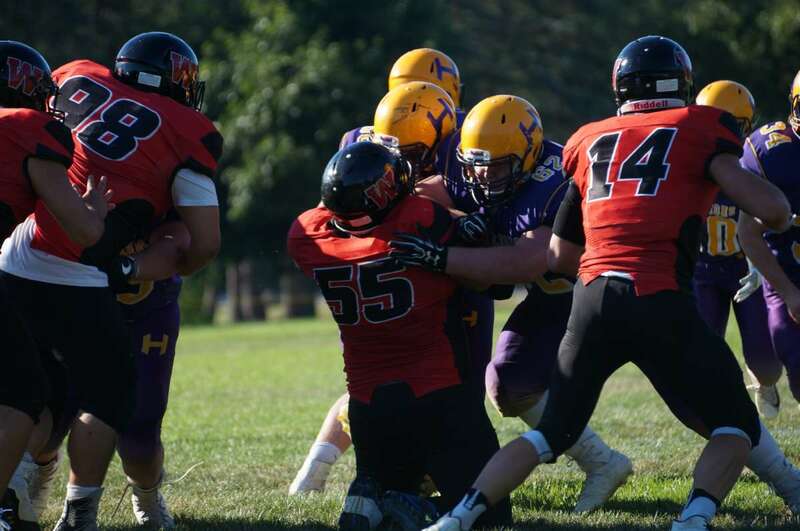 On defence, Charles Doering had one solo tackle and seven assisted tackles, Zechariah Willems had eight assists and a forced fumble, and Owen Macleod had six assists. The Stallions are on a three-game win streak going into a road game against an old foe; the Toronto Thunder. The Stallions and Thunder competed against each other in various leagues from 1995 to 2010 before the Stallions moved to the Ontario Football Conference. This week’s meeting is the first time the teams have competed since 2010. In the mid-90s the teams were competitive with the Stallions losing two hard-fought playoff games before the Thunder started dominating the league in the late 90s and early to mid 2000s. The Stallions had memorable victories in 2004 and 2007 over the Thunder as the Barrie based program began its run as one of the most elite programs in the province. Now the two powerhouses are reunited in league play and the plot could not be any thicker. The talented, skilled, and aggressive Thunder squad are a perfect 6-0 on the season but have won some close contests and have also shown some vulnerabilities. The 4-2 Stallions have a real shot at a win and with it a great opportunity to secure a playoff spot in a loaded OFC East Conference. The game this Saturday in Scarborough will be each current Stallion player’s opportunity to step up and make a memory against the team that many of the program’s alumni and coaching staff remember as their most formidable foe. The Huronia Stallions Junior Varsity team fell to 2-4 on the season with a devasting 19-15 loss to the Quinte Skyhawks. The Stallions held a 15-3 lead in the fourth quarter but collapsed on defence giving up two long touchdown passes in the final frame. The Stallions were led on offence by Quarterback Kieran Harrison who rushed for a touchdown and threw a touchdown to pass to Wide Receiver Brayden Harkness. Running Back Preston Howard had a fine game overcoming a mid-week injury to play good tough football. Defensive Backs Victor Garcia and Scott Laybolt continued their fine play with Garcia having several devastating downhill tackles and Laybolt catching an interception that he took for a 46-yard return. Nico Burton worked hard all game and almost forced a turnover with a crushing tackle in the final minute that left his facemask moored to the Quinte ball carrier until well after the whistle. The young Stallions take the field this Sunday against a strong Toronto Thunder team.